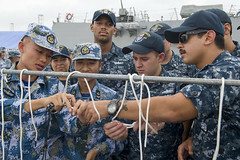 While visiting Zhanjiang, Sailors from the ship spent time building relationships with their People's Liberation Army (Navy) counterparts through both leisure and professional activities. 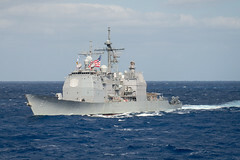 The USS Shiloh (CG 67) Sailor missing since June 8 has been found alive aboard the ship. 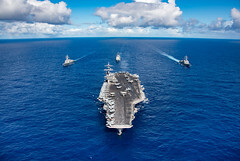 Ships of the USS Carl Vinson Carrier Strike Group are visiting Pearl Harbor, arriving June 13-14 after several months of operations in the Western Pacific. 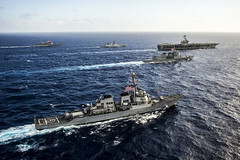 USNS Montford Point (T-ESD 1) and USNS Soderman (T-AKR 317) performed a “skin-to-skin” maneuver near Saipan, July 12-13. 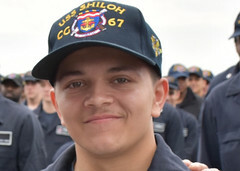 The USS Shiloh (CG 67) Sailor who presumably went overboard on June 8 has been identified as Gas Turbine Systems Technician (Mechanical) 3rd Class Peter Mims. 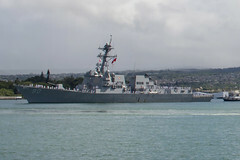 The guided-missile destroyer departed Joint Base Pearl Harbor-Hickam, June 13, for an independent deployment to the Western Pacific and South America. 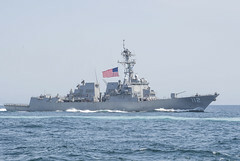 The guided-missile destroyer will return home to Pearl Harbor, June 13, after a successful five-month deployment. 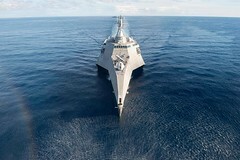 The littoral combat ship is conducting an expeditionary preventive maintenance availability in Cam Ranh, Vietnam, as part of a technical visit to the international port. 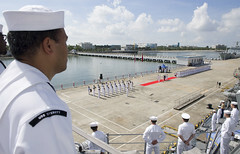 The guided-missile destroyer arrived in Zhanjiang, June 12, for the U.S. Navy's first port visit of the year to mainland China.